Creating a pattern from scratch is like putting a puzzle together and you aren’t quite sure where all the pieces go. I have never been good at puzzles so there were some days in the early stages of developing the pattern that I was frustrated and ready to give up. If it weren’t for the encouragement from my friends reminding me how much I could help other people I would have given up. 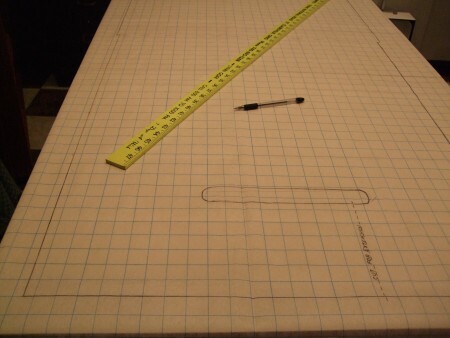 I never took drafting in school and used readymade patterns for sewing. Give me directions and I can follow them, but it’s another thing to actually create the pattern. I began by taking measurements. The car seat back, cushion, and the distance from the top of the seat cushion to the floorboard are but a few. I got the tissue paper and cutting table ready to begin marking. Once I had the dimensions down I stared at it and thought something was missing. Oh yes, how will I get it over the headrest? I went back to the car and measured the area where the headrest sits on the seat back and how far down the back of the seat I want the slipper to come. Now back to the “drawing board.” What I decided it needed was an oval opening to go over the headrest. I measured down from the top of the pattern and put the oval in. I then marked the lines for where the seat cushion meets the seat back. The pattern is done. I placed two layers of fabric on the cutting board and put the pattern on top and pinned it in place. After cutting and sewing it up, I cut the oval hole for the headrest and turned the slipper right side out. Hum, another puzzle to solve. How do I get it over the headrest? I stared at it for a long time and made several paper “slippers” trying to figure it out. Finally, I decided it needed extensions made for the back flap so they could overlap and secure with Velcro. Once I had the extensions on the slipper I added the straps at the cushion area to secure the Ruby Slipper in place on the car seat. The pattern is done. Stay tuned for part three: What’s involved with getting a patent.